We’d love your help. 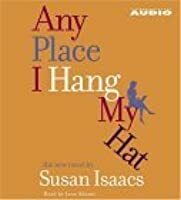 Let us know what’s wrong with this preview of Any Place I Hang My Hat by Susan Isaacs. To ask other readers questions about Any Place I Hang My Hat, please sign up. Did anyone else get tried of the negatives in this book? It was a challenge for me to keep reading. I think I am pretty literate but I had to look up many words. Some she made up? I did like the ending though. This book captures in an unexpected way the intersection between what we want from the people we love and our ability to trust them to give it to us. It's nuanced in an unusual way so that you're right with the narrator. I'm giving this three stars because really, the writing is good. Isaacs is queen of the one-liners and witty observations, none of which I could remember five minutes later. And the story ended up the way it should, in my mind -- a love story without any sap or melodrama. That said... the central plot line (even that is difficult to really say -- is it Amy and John, or Amy's search for her mother?) was drawn waaaaay out with information that in no way seemed necessary. Lots of information about A I'm giving this three stars because really, the writing is good. Isaacs is queen of the one-liners and witty observations, none of which I could remember five minutes later. And the story ended up the way it should, in my mind -- a love story without any sap or melodrama. That said... the central plot line (even that is difficult to really say -- is it Amy and John, or Amy's search for her mother?) was drawn waaaaay out with information that in no way seemed necessary. Lots of information about Amy's job as a reporter for In-Depth, and way too much information about In-Depth in the first place. There was a pointless conversation with her boss over an issue not at all related to the book which almost got Amy fired, and then a "make up with the boss" scene -- but why? As filler? As a way for the author to increase the suspense for the meeting-her-mother scene? It didn't work for me. Freddy Carrasco got way too much page time in this book -- when he just seemed to be an excuse for the author to muse on her own parentage. And Tatty -- an unlikely best friend for someone of Amy's intellectual ability -- serves no real purpose, except for the author to rehash things that already happened -- things that I, the reader, already know. About 2/3 of the way through the book, Amy becomes concerned that Tatty only looks for men in bars, and men in bars (don't you know) are necessarily full-fledged alcoholics. What? Back to the story, please. Even within scenes where I was engaged and interested in where the story was going, suddenly there would be a distracting tangent. Who's calling -- John? Well, no, but in her excitement to answer the phone, Amy falls off the couch and sustains several broken ribs. Excuse me? Does this happen? Is it really possible? Amy's about to learn information about her grandparents from the woman who bought their home -- and instead, there's a long musing about the decor of the living room. Hmm. I was with this book about 60% of the time, and I like a smart, feisty heroine, but still. Maybe I'm a cynic. I found this at a used book sale, signed, and gave it a go. I thought I'd relate to it, despite the chick-lit feel to the plot. The main character is a writer who had a rough start, but has a strong will and work ethic. And yet I didn't end up wanting to relate to her at all. Usually, if I don't like a main character I have a hard time finishing the book. I made myself finish the book. For starters, the first few chapters include startling spelling and grammatical typos. What Maybe I'm a cynic. I found this at a used book sale, signed, and gave it a go. I thought I'd relate to it, despite the chick-lit feel to the plot. The main character is a writer who had a rough start, but has a strong will and work ethic. And yet I didn't end up wanting to relate to her at all. For starters, the first few chapters include startling spelling and grammatical typos. What happened there? The narrative comes of as trying so hard to be funny and 'New York kitschy', without succeeding. The stereotypes in the book are pretty thick, and if the main character reminded me one more time that she went to Harvard, or that her father went to jail, and that she was a writer for In Depth, I would have wondered if my memory had left me. Didn't she say that a few pages back? Well, here it is again. Lastly, again, being a cynic and having s negative view of the wedding industrial complex...getting upset that your boyfriend doesn't propose after only two years? 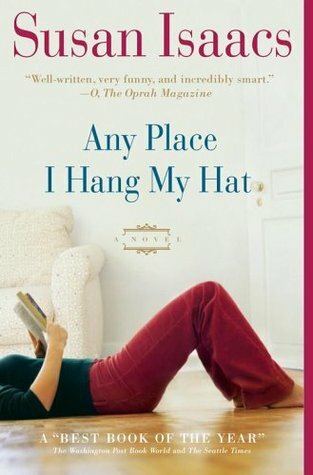 Amy Lincoln, the main character,in "Any Place I Hang MY Hat", is a smart young woman who has made her way in the world. She is plucky and flawed. Even though Issacs is wonderfully talented and has a great way with modern description and insight into the life of the single women, however,I never really got immersed in the plot. I always felt like an outsider and kept thinking that the story could have been told in half the time and been twice as engaging. This book was not for me. Enjoyed this book quite well. How is it that I've been picking books that all seem to have a common thread of being grateful for what we have and looking at the positives in life? Smart, successful Amy Lincoln has made her way out of poverty, but as she nears 30, she realizes she's brought an awful lot of emotional baggage with her on her journey out of the housing projects of New York. Finally realizing that she'll never get free of her past - and attain what she really wants: a loving family of her own - Amy goes looking for (dare I say it?) closure by seeking out the mother who abandoned her. I liked it. The emotions and issues were real, but the tone was light enough th Smart, successful Amy Lincoln has made her way out of poverty, but as she nears 30, she realizes she's brought an awful lot of emotional baggage with her on her journey out of the housing projects of New York. I liked it. The emotions and issues were real, but the tone was light enough that it wasn't a dark and miserable read. I rarely cry reading, but this one got a tear or two out of me. The theme of abandonment and longing to belong are poignant- and made more so by where I am in life's journey. Amy Lincoln is a young political reporter in NYC, covering the democrats leading up to the 2004 Presidential election. This first person narration is generally compelling, often amusing, and sometimes touching only occasionally bogging down in the topical or veering too close to the maudlin. What started out as a 3.5 turned into a 4 for me by the time it was over. I do not like to give up on books and I am glad I stuck it out with this one. It was a bit of a struggle for me for a little while. This book could not keep my attention. Could not finish it. This was a light, fun, summer read for me. I enjoyed it, and it didn't require a lot of effort, which is sometimes exactly what you need. It just never seemed to get started and I felt no connection with any of the characters. Although I enjoyed Isaacs' somewhat snarky narration style, I felt that the book was a little too cliched, especially the ending. Great book. Great read. Totally enjoyed it. Fluffy read; good for vacation. Main character has very tough childhood, finds it difficult to commit as an adult. Nevertheless, she finds true love. Ok – very fluffy. The first book I've read by this author is the story of a woman who was abandoned by her mother. Her in-and-out-of-prison-again father and grandmother raised her. She is a writer for a magazine in NYC and uses her connections to find her mother. This book kind of dragged in the middle. The author went off on wity tangents that maybe were just a little too intelligent for me to follow. I almost put this one down to move on to something more interesting because I just couldn't get drawn in to the plot right away. The reader first meets main character, Amy Lincoln, on assignment for In Depth, the cerebral magazine that offers no photos, only "in depth" articles about current events and political happenings. She is at the fund-raising event in the private home of newly declared Democratic candidate for presidency--Senator Thomas Bowles. She has spent several days with his campaig I almost put this one down to move on to something more interesting because I just couldn't get drawn in to the plot right away. The reader first meets main character, Amy Lincoln, on assignment for In Depth, the cerebral magazine that offers no photos, only "in depth" articles about current events and political happenings. She is at the fund-raising event in the private home of newly declared Democratic candidate for presidency--Senator Thomas Bowles. She has spent several days with his campaign and it is her job to write about his political platform. It is a typical, boring event until a young man, soaking from the rain, bursts in and announces that the senator is his never seen before father. I was afraid that I was going to be reading about Amy's off the record search for the truth in order to reveal the hidden scandal of the good senator. I almost put the book down. It was beginning to sound too much like current politics and celebrity life and I wasn't interested. Something, though, made me keep going and I am so glad I did. Abandoned by her own mother at 10 months, Amy was raised by Grandma Lil, a leg-waxer at a salon that caters to the well-to-do and upscale clientele. Grandma is anything but well-to-do and upscale. She is rough and hard, shoplifts dinner (among various items), and has visions of teaching Amy the finer things in life--posture, dinner manners, social niceties...things she picks up in the conversations at the salon. Never mind that Grandma had no money herself and that the two were living in poverty with a social worker keeping watch. That social worker and the school guidance counselor of Amy's inner-city, impoverished school turned Amy's life around by getting her into a prestigious New England boarding school that wanted to "give back" by offering scholarships to "deserving, poor girls". Amy was on it! Bright and hard-working, Amy went from that school to Harvard and then Columbia School of Journalism, and now...look where she is! Where was Amy's father? He was a small time wannabe "mafia" member. In and out of prison so many times that when he finally did get out and go on the straight and narrow it wasn't helpful for his rich lady friend to know that he had a grown daughter. She and her father remain close, well, as close as they can given the situation. They meet up once a month in an out of the way diner. Amy's father explains these visits to his "friend" as meetings with his probation officer. Amy had always tried to talk to her father about her mother. What was she like? What did she like? What did she look like and did she love Amy? Why did she just leave? Is she still living? She has always felt incomplete not knowing and now that young man claiming to be the senator's son has made her determined to find the truth. Using what press credentials she has and not being completely honest in all the situations, Amy begins digging to find what she wants, no NEEDS to know. That is the story--not that of the young man who burst into the fund-raising event--but that of Amy and her inability to be whole until she finds what she needs to know. That is the story I loved and couldn't put down once I began the journey with Amy. I admired her determination and her ability to walk the line between honesty and well, not quite so honest. I got impatient with her indecision about her current romantic relationship with John, but that was a different thread of the story, and understanding Amy's quest for the truth, an understandable one as well. I didn't really like this one and I struggled to finish it. The writing wasn't bad. I just didn't care much for the story. Kind of a bummer. It does have a pot of gold under the rainbow when it ends. Not my favorite by far! The writing style is witty and engaging, and there's a mystery to solve, and a romance, all very skillfully tied together. But don't look for complexity or depth here. Just do what you're told and root for the plucky, virtuous heroine, whose few endearing "flaws" are the result of having had a rough childhood, whose success in life is entirely due to her own wonderfulness, and whose suffering has always been caused by other people: other, lesser, people whose flaws are not easily attributable to The writing style is witty and engaging, and there's a mystery to solve, and a romance, all very skillfully tied together. But don't look for complexity or depth here. Just do what you're told and root for the plucky, virtuous heroine, whose few endearing "flaws" are the result of having had a rough childhood, whose success in life is entirely due to her own wonderfulness, and whose suffering has always been caused by other people: other, lesser, people whose flaws are not easily attributable to their life experiences, but are apparently congenital, and whose fashion choices, such as cheap necklaces and unfashionably curly hair, reveal their inner badness. Enjoy feeling morally superior, and don't wonder how the villain got that way, or what it's like to be them. And if you're left at the end with the nagging feeling that something important has been left unexplored, well, clearly there's something wrong with you. Amy Lincoln is a journalist at In Depth magazine; she has a best friend, Tatty, from one of New York's elite families; a great boyfriend, John, a documentary filmmaker; and, oh yes, a criminal father and a mother who abandoned Amy as a baby to her Grandma Lil. Amy is writing a story on Presidential hopeful Thomas Bowles, and when a college student shows up claiming to be Bowles's illegitimate son, Amy's involvement with that story causes her to want to discover the truth about her own family. Alt Amy Lincoln is a journalist at In Depth magazine; she has a best friend, Tatty, from one of New York's elite families; a great boyfriend, John, a documentary filmmaker; and, oh yes, a criminal father and a mother who abandoned Amy as a baby to her Grandma Lil. Amy is writing a story on Presidential hopeful Thomas Bowles, and when a college student shows up claiming to be Bowles's illegitimate son, Amy's involvement with that story causes her to want to discover the truth about her own family. This is the story of Amy - Harvard grad, successful journalist, raised by a witless grandmother and criminal father, abandoned by her mother at 10 months - Lincoln. The plot line is of a three fold search - for her mother, for belonging and for love - and how they interfere and overlap with each other. The plot, which was generic but with redeeming parts, was second to the real journey, into and out of and churning through Amy's troubled but thoroughly normal mind. Now minds can be very fun place This is the story of Amy - Harvard grad, successful journalist, raised by a witless grandmother and criminal father, abandoned by her mother at 10 months - Lincoln. The plot line is of a three fold search - for her mother, for belonging and for love - and how they interfere and overlap with each other. The plot, which was generic but with redeeming parts, was second to the real journey, into and out of and churning through Amy's troubled but thoroughly normal mind. Now minds can be very fun places to hang out, but they also contain an immense amount of tiresome drivel. Most of the book I felt like I was wading through driveling tears and insecurities and observations that were neither humorous nor tragic nor important to furthering the plot or character.